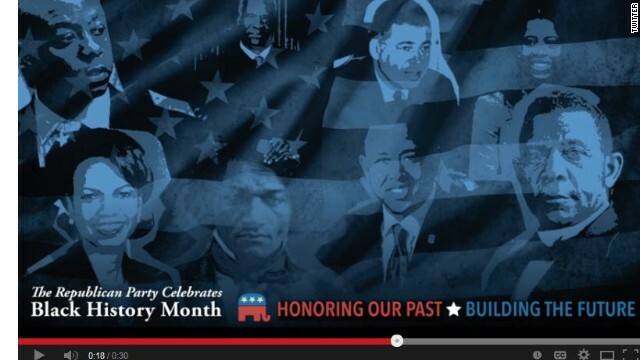 (CNN) - The Republican National Committee announced Monday the launch of its first ever paid ad campaign in recognition of Black History Month. The RNC, which has taken on an active new approach to reach out to African-Americans in the past year, says it will run the commercials in black media outlets and urban markets, according to a press release. The campaign includes radio ads that pay tribute to three prominent black Republicans: Judge Sara J. Harper of Ohio, Dr. Louis Sullivan of Georgia and Michigan businessman William "Bill" Brooks. The radio spots will air in Washington, D.C., Atlanta, Cleveland and Detroit. A set of print ads will recognize former Secretary of State Condoleezza Rice; Sen. Tim Scott of South Carolina; Mayor Mia Love of Saratoga Springs, Utah; the late-Sen. Hiram Revels; and Frederick Douglass. "This Black History Month, we are excited about the unique opportunity to share the remarkable stories of black Republicans who have broken barriers and opened doors so that others may succeed," RNC Chairman Reince Priebus said in a statement. "Recognizing these truly accomplished trailblazers through black media is an important opportunity to honor our past and build our future." The RNC did not comment on how much it's spending on the ad buy. Since last year's presidential election, the RNC has been beefing up its resources to reshape its message to African-Americans as well as the country's growing populations of Latinos and Asians. Romney won 6% of African-American voters nationwide in 2012, according to CNN Exit Polls. The Democratic National Committee is skeptical about the RNC's approach. “The RNC’s ad buys ring hollow since their party has continually opposed policies that give all communities a fair shake and allows everyone’s voice to be heard,” Kiara Pesante, the DNC's director of African-American media, said in a statement. The organization will also be recognizing Black History Month in a month long series online. Another political operation, Ready for Hillary PAC, is also reaching out to engage the black community this year. The group, formed to encourage Hillary Clinton to run for president again, announced Monday the launch of its Black Americans program, an effort to reach out and partner with barbershops, beauty salons, small businesses, DJs, nightclub promoters and civic organizations. "In 2012, we saw black voters casting ballots at a higher rate than their counterparts for the first time. To continue this trend, we are engaging this community now for the 2014 mid-term elections and a potential Hillary Clinton 2016 campaign," Quentin James, Ready for Hillary's Black Americans Director, said in a press release. The group has scheduled events in Atlanta, Baltimore, Cleveland, Columbia, Las Vegas, Los Angeles, Miami and Washington, D.C.
Ready for Hillary will announce a National Black Americans Advisory Council later this month, the group added. Great that the rnc is bridging the gap! It's funny to watch the GOP bafoons show their FAKE conserern about blacks and Latinos like they care or would do anything to help them or anybody else except themselves . They just want your votes, but why vote AGAINEST your own best interest by voting for these GOP incompetent bums that are running on 1950s issues and hiding behind obamacare to hide their total incompetence to govern. Vote for any GOP canadates at your own risk. Vote in November and kick these GOP losers out. They have been holding the country back for five years!!!!!! Wow. Republicians must be thinking that since Lincoln was the first Republician president and he did so much for the African-American community that the modern community of African-Americans will stick by them. To bad that Lincolns republician party closely resembles today's democratic party. "This Black History Month, we are excited about the unique opportunity to share the remarkable stories of black Republicans who have broken barriers and opened doors so that others may succeed," RNC Chairman Reince Priebus said in a statement. Yes, it's a "unique opportunity" because you've never bothered to do it before. It's too late ReiNCe PRieBuS.